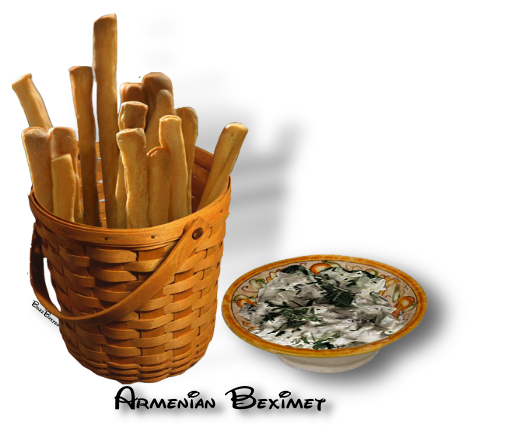 Beximet are hard sticks of Armenian bread that are commonly served with dips and sauces. The bread is baked with melted shortening and is commonly provided for children as a snack. 2. Add all ingredients, mix well and knead. 3. Let rise for 2 hours. 4. Make balls (size of an orange). 6. Brush tops with evaporated milk. Slit sticks three quarters of the way down every 2 inches. 7. Bake in preheated 400°F oven until brown, approximately 10 minutes.